"Like" token, awarded by Dzahn. Hosting of doc.wikimedia.org is being migrated from the CI master (contint1001.wikimedia.org) to a Ganeti VM doc1001.eqiad.wmnet. The documentation generated by CI is published over rsync. 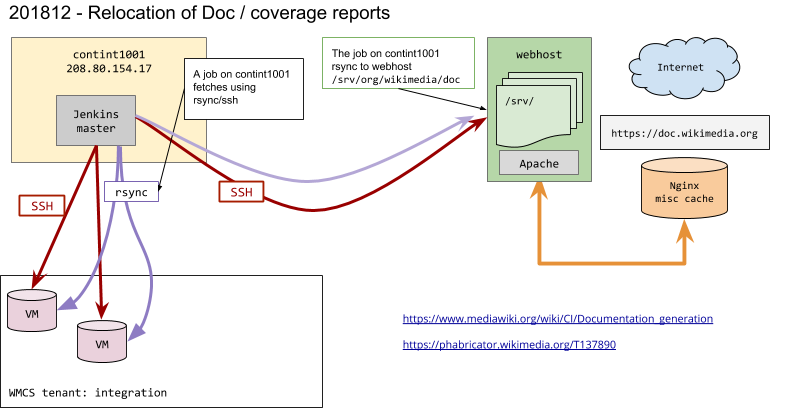 The rsync daemon the daemon on the receiving end runs as doc-uploader and exposes a doc rsync module corresponding to /srv/docroot/org/wikimedia/doc/. CI admins would sometime need the ability to cleanup published doc. For example to remove obsolete documentations (archived repos, closed branches) or move files around when a new entry is added. We sometime have to manually delete directories, typically when a repository is archived from Gerrit. So it is merely a convenience. I would like contint-admins to be granted a sudo rule to run command as the doc-uploader user. The request has been approved in today's SRE meeting, but with an additional comment that this should have some follow-up to remove the need for manual actions from the workflow in the future. I can confirm it is working fine. Thank you. Anyway it is good, just now have to fix the umask for rsync! just now have to fix the umask for rsync!